International Trade MEPs call for more US market access, reforming investment protection and retaining EU standards in the ongoing TTIP talks. The recommendations to the Commission negotiators on the Transatlantic Trade and Investment Partnership (TTIP), approved in committee by 28 votes to 13 with no abstentions, still need to be endorsed by Parliament as a whole. EU GDP is “heavily dependent on trade and export”, so a “well-designed” deal with the US could help boost the industry contribution to EU GDP by 15- 20% by 2020, as EU firms, especially small, medium and micro enterprises, would benefit from a market of 850 million consumers, says the text. But at the same time, contradictory study findings make the TTIP’s real benefits for the EU economy hard to assess, note MEPs. They therefore stress that the talks must be transparent, in order to deliver an “ambitious” but “balanced” deal, with shared benefits across EU member states, leading to an “effective, pro-competitive economic environment” and precluding non-tariff trade barriers. High levels of protection for EU consumers their data, health and safety must be guaranteed, and social, fiscal and environmental dumping must be prevented, they add. MEPs say the TTIP must end the “unequal treatment of European investors in the US”, by establishing a reformed and fair system for investors to “seek and achieve redress of grievances”. 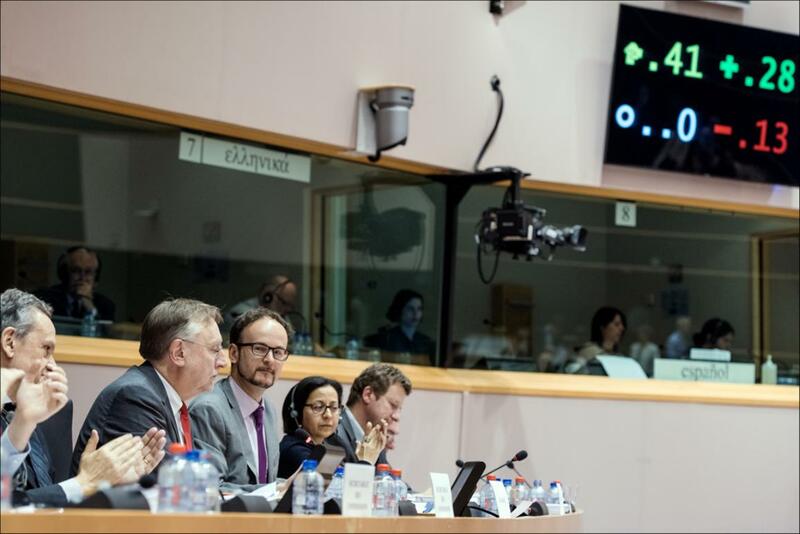 This new system should be based on the recent “concept paper” on a reformed investor protection system, as presented by Trade Commissioner Cecilia Malmström to the EP Trade committee on 6 May, and also on ongoing talks among EU trade ministers. It should include a “permanent solution” with “publicly appointed, independent judges”, “public hearings” and an “appellate mechanism”, while respecting the jurisdiction of courts of the EU and its member states. In the medium term, a public investment court could be used to settle investor disputes, MEPs add. They also warn that the right to regulate in the public interest needs to be protected and frivolous claims prevented. While aiming to eliminate all customs tariffs, the two partners should nonetheless negotiate an “exhaustive list” of “sensitive agriculture and industrial products” which would either be exempted from trade liberalisation, or subject to longer transitional periods, say MEPs. They ask the EU negotiators to “make every effort” to insert a “safeguard clause”, reserving the right to close markets for specific products in the event of import surges that threaten to cause serious harm to domestic food production. They also ask the European Commission to encourage the US to lift its ban on EU beef imports and include strong protection for the EU’s geographical indications system. Negotiators must aim to eliminate excessive procedures for vetting imports on food and plant health grounds and there should be “mutual recognition of equivalent standards”, say MEPs. At the same time, EU standards should be safeguarded in areas where US ones are “very different”, e.g. for authorising chemicals, cloning or endocrine-disrupting chemicals. The EU “precautionary” principle must be respected, they add. The TTIP should abolish “any existing restrictions or impediments of export for fuels, including LNG and crude oil” between the EU and the US, so that the deal adds to EU energy security and reduces energy prices, say MEPs. The TTIP deal should include a specific energy chapter, which must also help maintain the EU's environmental standards and climate action goals, they add. EU data privacy rules must not be compromised by the integration of the EU and US e-commerce and financial services markets, say MEPs. A TTIP deal should explicitly exempt all existing and future EU rules on personal data protection from any concessions. Provisions on the flow of personal data could be negotiated with the US only if the same data protection rules are applied “on both sides of the Atlantic”, they add. The TTIP talks should remove current US restrictions on foreign ownership of maritime and air transport services and airlines, such as the “Jones Act” or the “Air Cabotage law”, which “seriously hinder market access for EU companies” MEPs also call for more EU access to US telecommunications markets”. The wide disparity in the openness of the two parties’ public procurement markets must be remedied, say MEPs. TTIP should achieve a “significant opening” of the US public procurement market at all levels of government, so that EU firms, and particularly small and medium-sized ones, can bid for US public contracts in the fields of construction services, civil engineering, transport and energy, they add. MEPs also ask EU negotiators to keep in mind the EU interests in penetrating the market for the supply of “highly specialised services”, such as engineering and other professional services, financial or transport services. MEPs reiterate their wish to exclude public services from the scope of the TTIP (including, but not limited to, water, health, social services, social security systems and education). MEPs ask EU negotiators to insist that the US ratify, implement and enforce the eight International Labour Organisation core conventions (it has so far ratified only two) and say that US companies’ implementation of labour provisions should be monitored more closely, by involving social partners and civil society representatives. MEPs urge that the transparency of the TTIP talks should be further improved, by making more texts available to the public and obtaining the US’s permission to publicise more documents. MEPs warn that “Any refusal to disclose a negotiating proposal” should be justified and also ask that all MEPs be granted access to “consolidated texts” (chapters which consolidate positions of the EU and the US). A deal between the world’s two biggest economic blocs, which already “share and cherish” similar principles and values has the potential to establish global norms, and avoid the possibility that countries “with different standards and values” might assume this role instead”, say MEPs. The Trade Committee text now needs to be endorsed by Parliament as a whole, in a plenary vote currently scheduled for 10 June (tbc).